THIMPHU, Bhutan, February 24, 2014 (ENS) – For his birthday on Friday, the King of Bhutan received two 2014 electric Nissan LEAFs, the start of a government fleet of electric vehicles that will characterize the future of this Himalayan Kingdom. King Jigme Khesar Namgyel Wangchuck, 34, known as the “Dragon King,” is popularizing the electric car to inspire his country to become a leader in the global move towards clean energy vehicles. 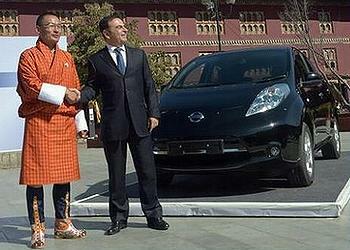 Nissan CEO Carlos Ghosn was in the Bhutanese capital of Thimphu Friday not only to present the Nissan LEAFs to the King but also to sign a partnership agreement with Prime Minister Tshering Tobgay that will chart their cooperation in achieving Bhutan’s ambitious clean energy goals. “We will develop a program,” said Tobgay who has backed the EV project since taking office in July 2013. “We will commit to a program to achieve zero emissions as a nation by a certain target date,” he said without naming that date. “We cannot go on this journey ourselves. We need the world to travel with us, and what better partner than to have the Nissan LEAF help us along this journey,” the Prime Minister said. Nissan, which has sold more zero-emission vehicles than any other company, will build on its EV expertise to electrify the country’s fleet and help Bhutan develop its charging infrastructure, Ghosn said. “There is a lot of courage, a lot of will, a lot of vision behind the Prime Minister of Bhutan’s positioning on the electric car, and I feel good about supporting this,” said the Nissan executive. “It’s within the interests of Nissan because we have our own interests here. But I think this can create a lot of other examples in the future and hopefully Bhutan can become a showcase,” said Ghosn. The royal government will study tax exemptions for electric vehicles from the green tax, sales tax, and import duties to encourage the transition. Rich in hydro-power, mountainous Bhutan has strong environmental and economic reasons for embracing electric cars. The country currently only uses five percent of the hydro-power it produces, exporting most of that electricity to neighboring India. But almost all of the revenue Bhutan earns from selling electricity is spent on fuel imported from India to run the nation’s existing vehicles, which number 36,000 in the capital, Thimphu, a city of 79,000 people. Reducing oil imports with this electric vehicle project will free up monies that can be used elsewhere. Starting with the two Nissan LEAFs presented Friday, Ghosn says Nissan will supply more electric vehicles and quick chargers to Bhutan through local distributor Thunder Motors. The government fleet and taxi fleets will be first to make the transition to zero-emissions motoring, with more electric vehicles available to the public shortly. The LEAF is conspicuous in Thimphu today, but with the Bhutan-Nissan partnership underway many more electric vehicles will be on the roads of Bhutan before long. Ghosn said the deal means hundreds of electric cars will arrive in the short term so that Bhutanese government officials can start driving them, and then thousands of LEAFS will be imported for sale to the public. Nissan has similar electric car promotion agreements with more than 100 nations, states and cities.